We didn't need to get up terribly early today, since we had the whole day to get back to New York for our last evening before going home. We decided not to go down for the busy breakfast in the hotel, but to pack up, check out of the hotel and head up to the Friendlys in Medford, where we had the last Lumberjack Breakfasts of our trip and talked over all the things we'd done. We got back on the I-95 and started the trip back down through all the places we'd passed on the way up. We took our time, but didn't have the heart to stop off at places we thought we might, such as Mystic and New London. We drove steadily and reached the city limits of NYC in early afternoon. 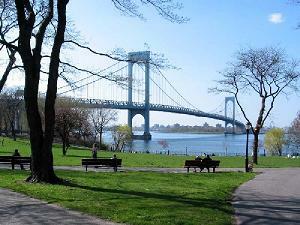 We crossed the East River across the Bronx Whitestone Bridge and continued through Queens towards JFK. This was the dangerous part of the trip, because I had no clear driving directions to our final hotel, and would have to play it by ear to some extent. I had visions of Chevy chase stopping to ask some homies directions like he did in National Lampoons Vacation. But luckily as we passed into Jamaica, the hotel was visible from the Belt Parkway and we pulled off the road and drove in. 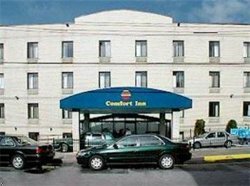 The hotel was the Comfort Inn JFK, and was a typical hotel airport in that the people staying there obviously were only there while waiting for a flight to somewhere else. Despite the name, it wasn't actually in JFK airport, but about 5 minutes drive. The view wasn't anything to write home about - there was a view of a junk yard out of our window. We unpacked the car, and dragged the cases up to the room. Unfortunately, we couldn't just peg out on the beds, since the car was due back to the rental place before 5pm and we wanted to find out where the check-in was so we wouldn't get lost the next morning. I checked with the front desk about connections to the airport in the morning, and was glad to hear they ran a courtesy shuttle bus just at the right time for us - 6.30! A couple of blocks down from the hotel was a really NYC gas station, and I knew the guy behind the counter had a gun there, it was that sort of place. Driving to the car rental place was relatively simple, since the car lots were well signposted once you were inside the airport perimeter. We found the Dollar drop-off, and handed our keys to a bored-looking inspector who gave the car the once-over and signed our slip saying that everything was fine with the car, and we could catch the Airtrain to the main terminals. We said goodbye to our trusty car, who'd been so far with us, and made our way up to the Airtrain terminal. The Airtrain turned out to be a driverless monorail system which quickly took us to Terminal 8, and as long as you stayed within the circle of the Airport was completely free of charge. We were delighted to see that Terminal 8 was the same building that we'd arrived at 10 days before, and we located the American Airlines check-in easily. It was late afternoon by then, and we went into the Airport restaurant area and Karen and I had chinese noodles while the kids had McDs. Once we were finished, we decided to go get a cab to get back to the hotel. As we left the building, we realised with a sense of deja-vu that the taxi-rank was exactly the same one we'd used when we had arrived at JFK ten days before. The taxi driver had a small contretemps with the dispatcher because this was a 'shortie' as he called it, they were more used to taking people into Manhattan. He drove us back to the hotel, but missed our street and we shouted to him to stop. He pulled over sharply, almost hitting a car to our right. He let us off in the car park of another hotel, and the bill was only $10. I tipped him $2, which I felt was generous in the circumstances for a 5 minute journey where we had to give him directions and he'd nearly killed us and left us a block away from our destination. Back in the hotel, the holiday felt well and truly over. We had no car and no place to go anyway. We had toyed with the idea of taking a cab up to Manhattan for our last evening in NY, but the gloom was on us, the tiredness was catching up with us, and we decided that the expense of cabbing it up and back would not be justified for the muted enjoyment it might bring. Instead we bought loads of snacks and drinks from the vending machine, and settled down for a long evening in front of the TV. Eventually, the kids fell asleep and we all settled down for our last night in NYC.